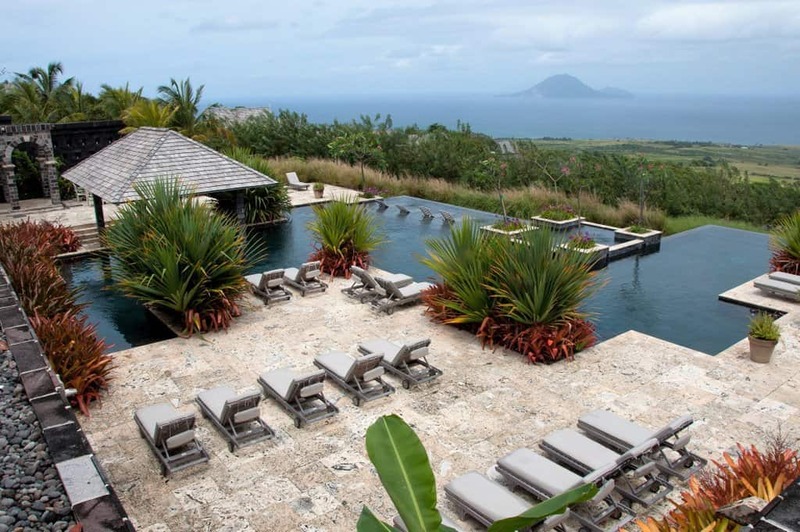 If you’re looking for Caribbean luxury in your life you won’t have to go far in St Kitts to find it. 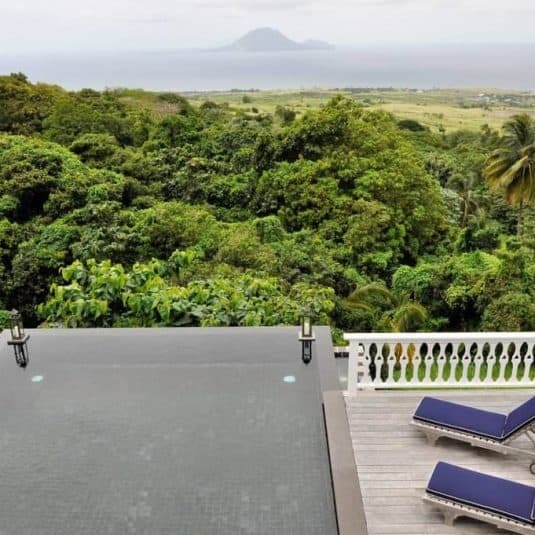 St Kitts’ hotels offer all types of luxury from restored plantation estates with rain forest spas to brand new eco resorts offering organic farm to fork menus. Then there’s the fabulous luxury private terminal, the Yu Lounge, at Robert L. Bradshaw International Airport. This little Caribbean gem is top of its game when it comes to luxury island escapes. 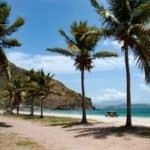 St Kitt’s and Nevis haven’t been hit by mass tourism yet so you’ll get much of it to yourself – now that’s a luxury in itself. 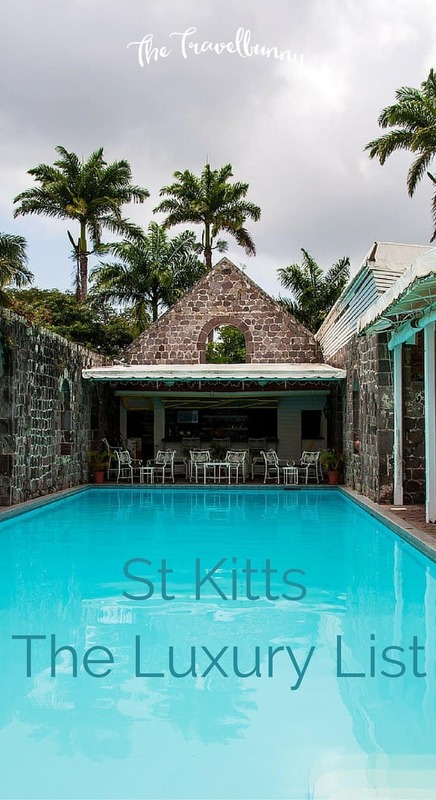 Let’s get acquainted with St Kitts’ sophisticated side. 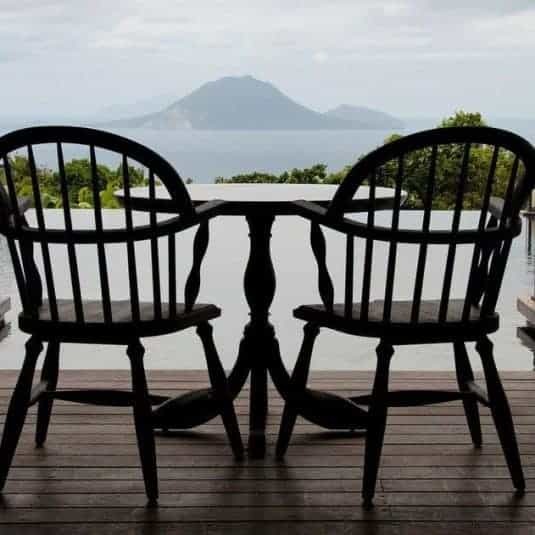 If you like your luxury infused with a touch of history and romance then Ottley’s Plantation Inn set at the foot of Mount Liamuiga on the island’s north eastern coast is the place for you. Ottley’s is set in 35 acres of lush green lawns which roll into a shady rainforest ravine with the scent of jasmine and frangipani floating in the air. Ottley’s started life as a 17th-century sugar plantation founded by Drewery Ottley who arrived in St Kitts around 1656 from Yorkshire. 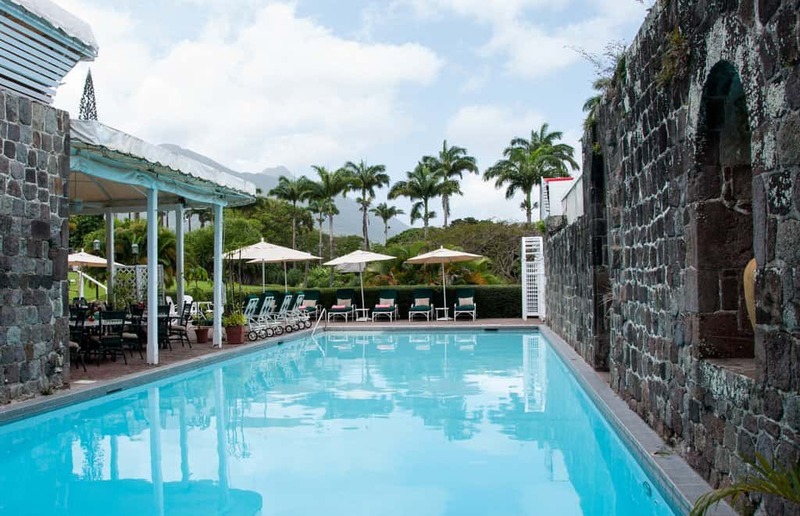 The spring-fed pool and hotel’s restaurant, The Royal Palm, are built into the walls and arches of the sugar factory’s boiling house – reminders of the estate’s sugar plantation history. The Great House exudes an effortless colonial charm. 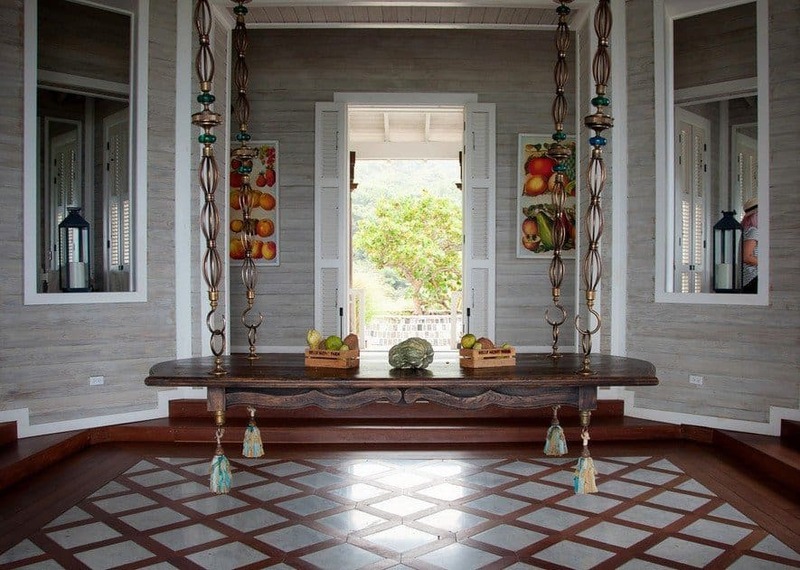 With views over the estate out to the Atlantic Ocean the wooden house with its white wrap-around veranda and yellow shutters stands out brightly from the lush green foliage in which it nestles. We walked amongst carefully tended borders brimming with exotic plants and foliage. 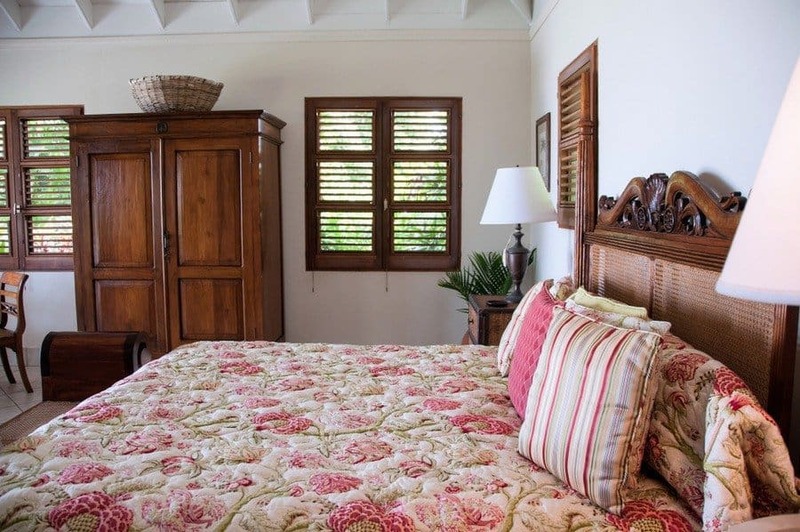 Bedrooms are spacious and undeniably romantic with mahogany plantation shutters, dark wood furniture and floral touches. There’s a variety of accommodation at Ottley’s with eight rooms located in the great house. There’s an old stone cottage and another 15 supreme rooms and suites with their own private plunge pools set all around the estate. If you’re in need of a pampering session (who isn’t?) 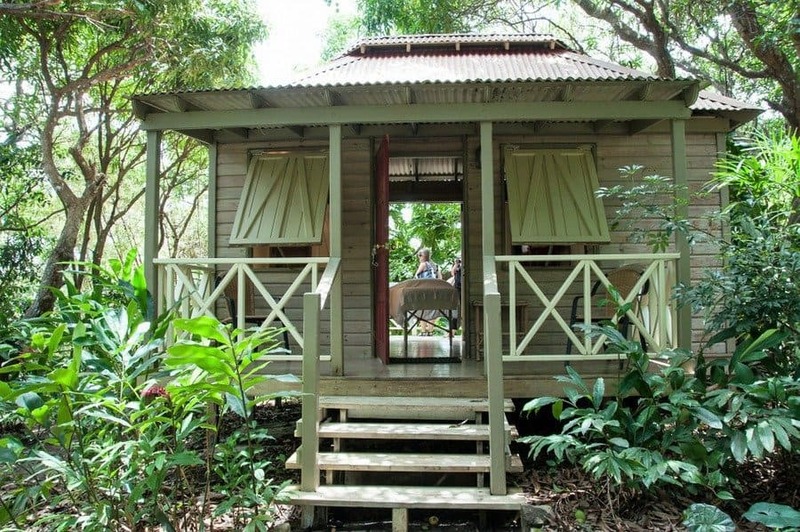 drop by the Mango Orchard Spa, a small wooden cabin set in the rainforest. A massage or facial amidst the rainforest surrounded by the sounds of nature will be one you’ll always remember. There’s a tennis court or croquet if you happen to be feeling energetic. We sampled Sunday brunch in the Royal Palm restaurant during our visit as well as tastings of some menu favourites. I ordered a Champagne Mimosa which went beautifully with the surroundings. 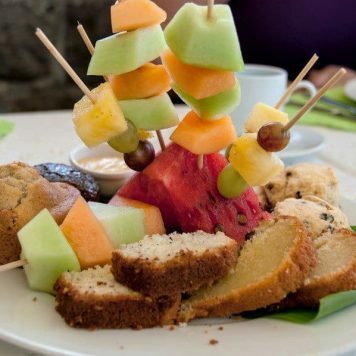 Brunch started with a tropical fruit and pastry platter. 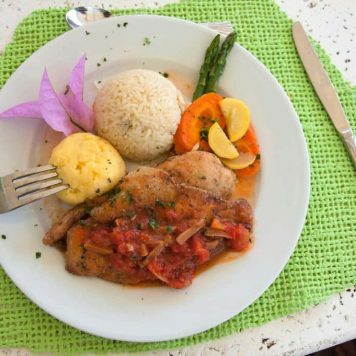 As a main I chose a traditional dish ‘Tilapia Martinique’ which comprised of fish with tomato-toasted almond sauce, cornmeal fungi balls (the Caribbean version of polenta balls) vegetables and Caribbean rice. Everything was delicious and I didn’t suffer from menu envy at all despite the gorgeous looking food the others had ordered. The restaurant is open to non-residents so if you’re not staying overnight you can go for dinner. The restaurant is meant to be one of the most romantic on the island for dinner. Ottley’s is about 20 minutes’ drive from the airport and about 10 minutes from Basseterre. 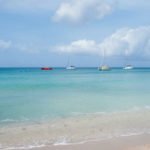 Complimentary daily shuttle buses transport guests to central beaches and Basseterre. If your taste in luxury is modern chic with an emphasis on the sustainable and organic then Belle Mont Farm will suit you nicely. 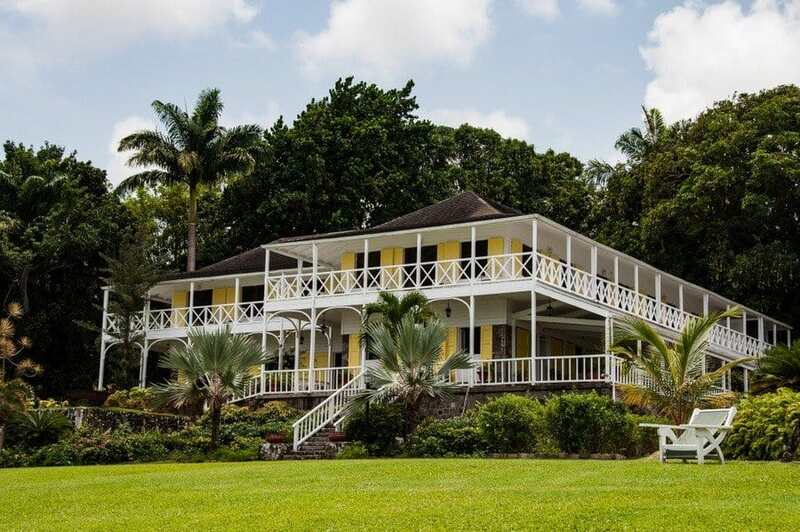 This property also occupies the site of a former sugar plantation in 400 acres of verdant hillside (Belle Mont means beautiful mountain) and has a modern colonial style with a hint of vintage styling. We made our way up into the hills through the 18-hole championship golf course designed by Ian Woosnam. The course was created without pesticides or fertilisers – there’s a whole team of weeders throughout the estate. This is the only edible and fully organic golf course in the world. As if it doesn’t take me long enough to get round 18 holes already without having to eat the course as well! We hop into golf buggies and carry on up a narrow path looking over the rainforest until we reach the reception area. The views when we arrive are breathtaking despite the gloomy sky. At 1,000ft above sea level we can see across the ocean to the island of St Eustatius in the distance. There are wide volcanic stone terraces with infinity pools, in-water loungers and clever, colourful planting to give areas of privacy without blocking the views. Colours are cool, calm greys, blues and mochas, which I love. It’s spacious, stylish and very modern. Stepping inside the great house I loved the contrast of colonial and quirky. 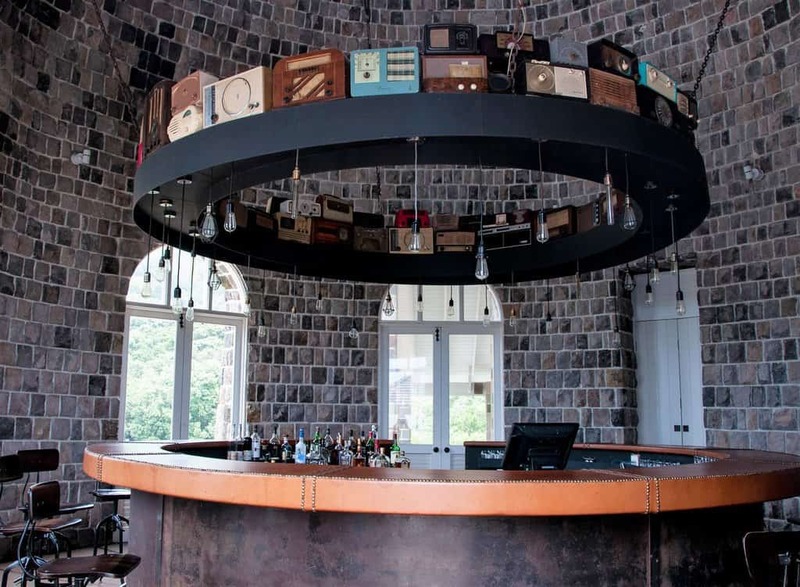 The circular Mill Bar sits right in the middle of the mill tower with a circular shelf of retro wirelesses and vintage-style light bulbs above it. 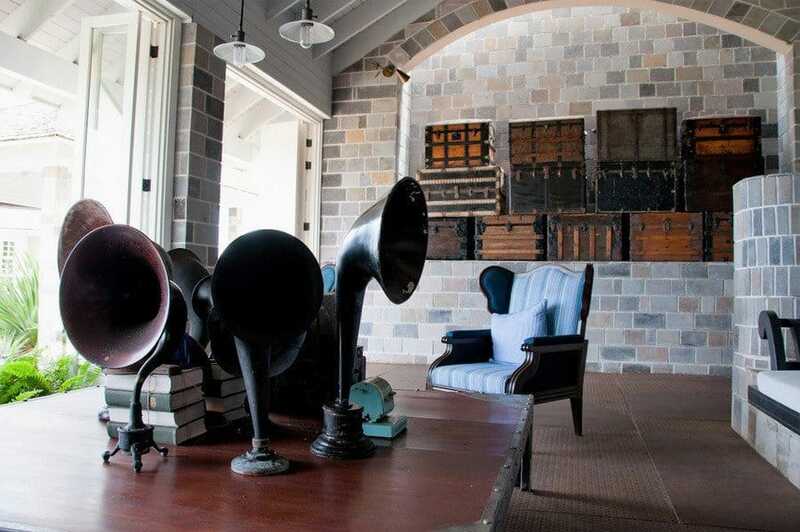 Moving into the lounge area there are more quirky touches; old gramophone trumpets and vintage travel trunks which add a relaxed vibe to an already comfortable space. Outside there’s a terrace of pineapple plants – you might also find one in the daily fruit box that’s delivered to your room. 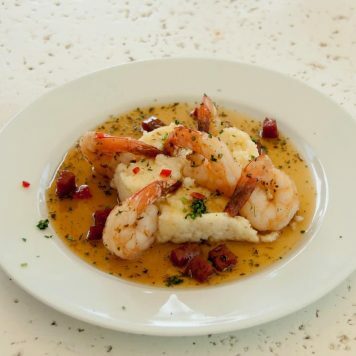 The restaurant serves farm to table organic dishes and Caribbean inspired cuisine from French chef Christophe Letard. 90% of the ingredients are locally sourced with much of it coming from the farm’s own 65 acres. We didn’t eat at Belle Mont Farm per se but at nearby Arthur’s on the black sand beach at Dieppe Bay ten minutes away. 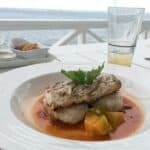 Arthur’s is also part of the Belle Mont Estate and I’ll cover our beach-side sea to fork meal (with coconut dumplings!) in another post. 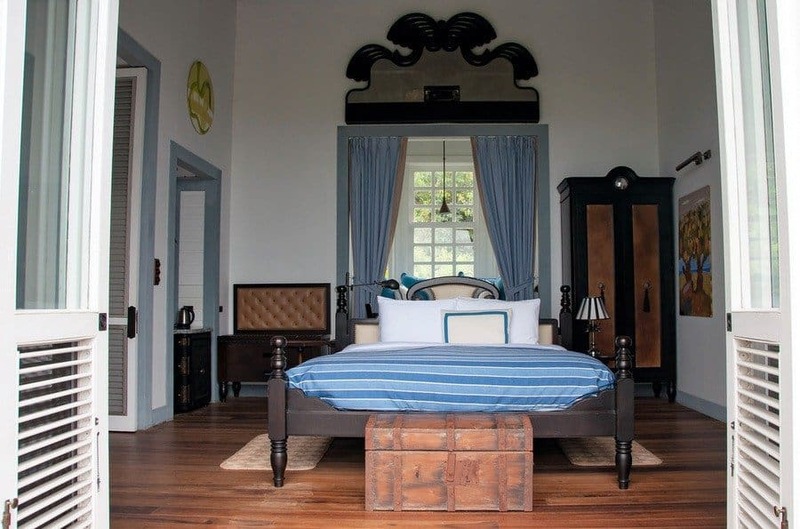 What I loved most about Belle Mont Farm are the guest houses which are built with locally milled stone and designed to look like the plantation worker’s cottages of times gone by. 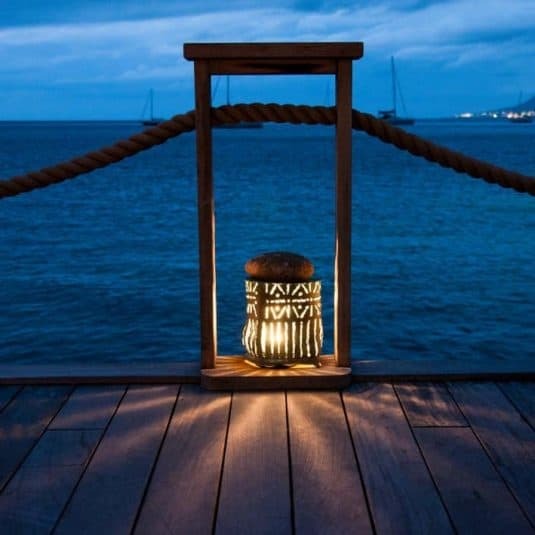 The guest houses are beautifully furnished in dark wood with blue accents – open the shutter doors at the foot of the bed and you’ll look out over your own private infinity pool and across the ocean. 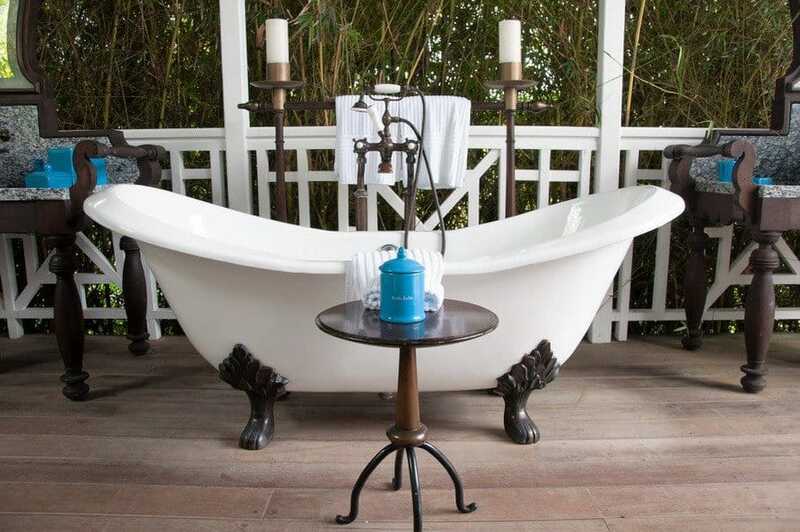 Don’t you just love the roll-top bathtub in the outdoor bathroom? – don’t worry there’s plenty of foliage to protect your modesty. 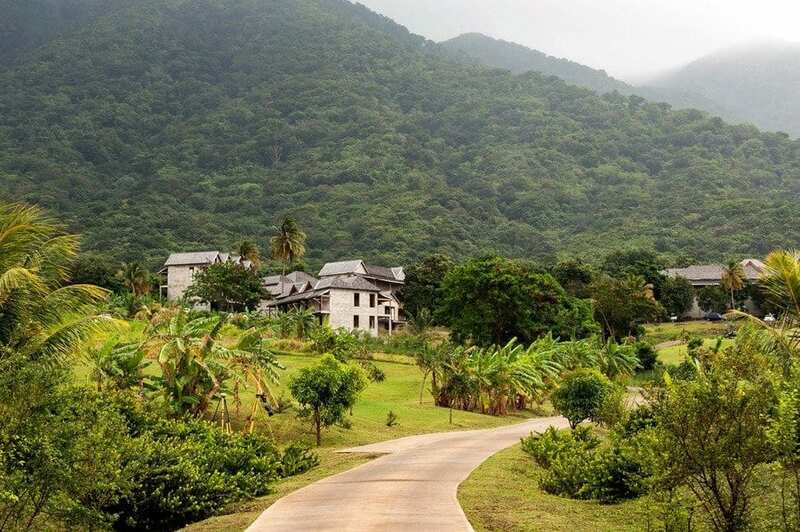 Belle Mont Farm is the initial phase of accommodation with 68 guesthouses currently open. A total of 84 are planned for this phase. 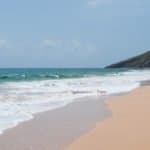 The airport is a 30 minute transfer away and as Belle Mont Farm is set up in the hills you’ll need to get a cab out to a beach. There’s a black sand beach 2k away but you’ll need to go further afield for white sandy beaches. Salt Plage started life as a salt export business where salt was mined from nearby pools before being transported overseas from Whitehouse Bay. Nowadays it’s where the yachting set head when they dock at nearby Christophe Harbour, a 300 berth marina attracting super-yachts and sophisticated sea-goers. You can arrive by boat, moor up and take a stroll down the jetty to order your cocktail and nibbles. 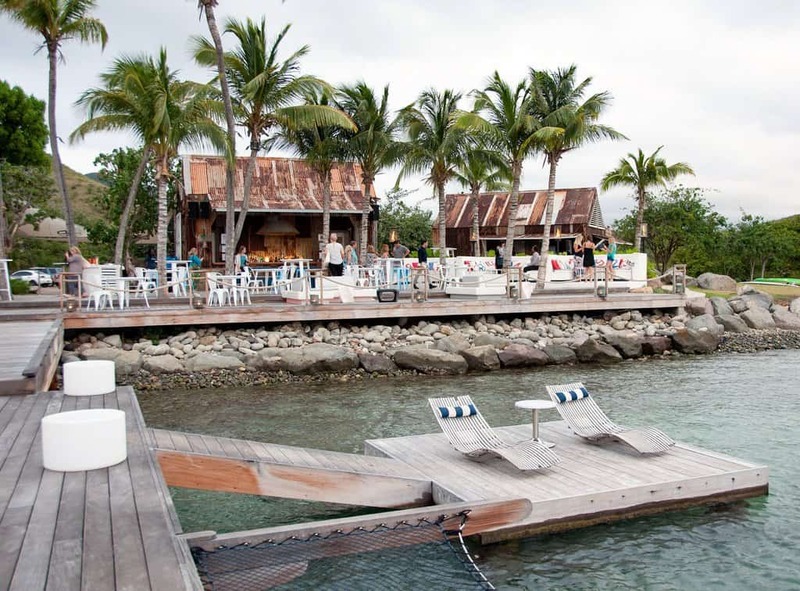 Salt Plage has been named by Conde Nast as one of their top 8 beach-side bars. The bar itself is a clever, up-cycled beach shack set on a contemporary deck studded with palm trees with a chill-out vibe. The deck faces west with blue Caribbean waters lapping at its edges. 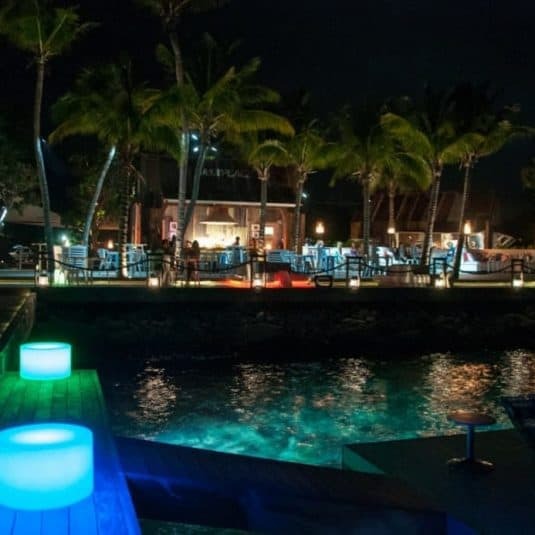 There are booth areas and bar stools and tables on the deck or contemporary loungers and a catamaran-style net on the jetty for sunbathing. There’s nothing else for it but to settle yourself in, order a house cocktail – I went for Doc’s Punch (actually I had two) – and watch the sun set into the horizon. At dusk the lights come on, the music turns up a notch and the place turns into party central. You can start indulging in Kittitian luxury from the second you step off the plane, or before, if you’ve flown BA Business class. You’ll be collected and taken by air-conditioned Porsche Cayenne to the Yu Lounge located in a private terminal just two minute’s drive away. Your passport is checked as you arrive at the lounge so you’ll have none of the stresses of airport immigration. 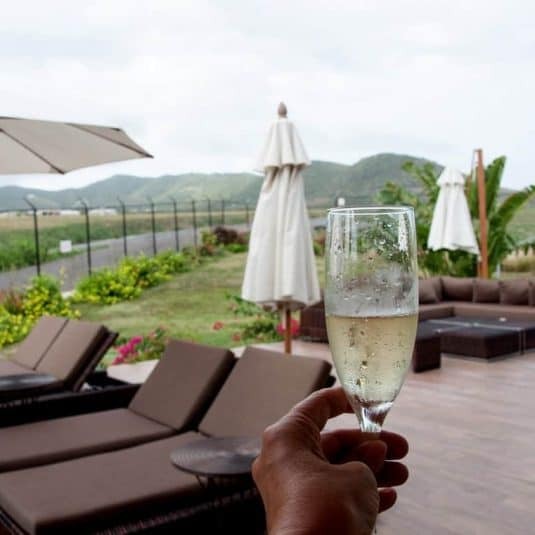 As you sip on champagne and enjoy a selection of gourmet nibbles you’ll be treated to your first taste of St Kitts’ luxury in the peaceful lounge. Step outside to soak up the sunshine in the lounge’s outdoor area as you wait for your luggage to be delivered. Relax on a sun lounger or dip your feet into the pool. The décor inside the lounge is chic, calm and sophisticated. 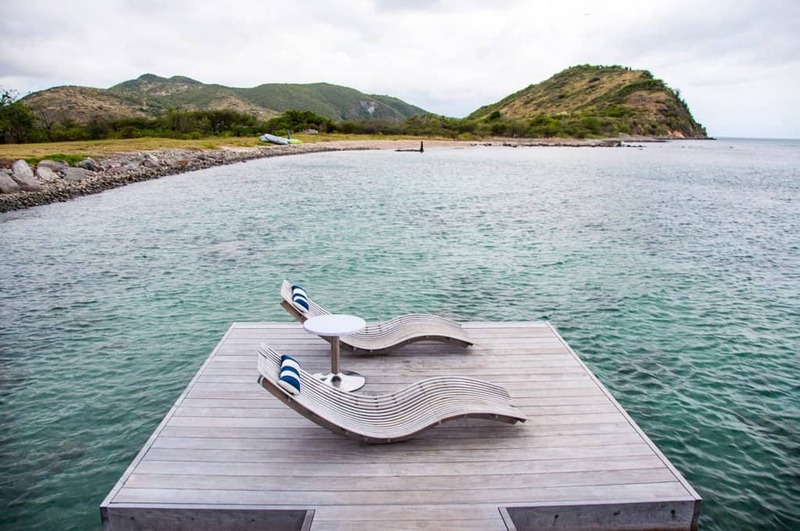 Yu Lounge is the ideal environment to recover from your flight and slip gently into St Kitts’ laid back vibe. 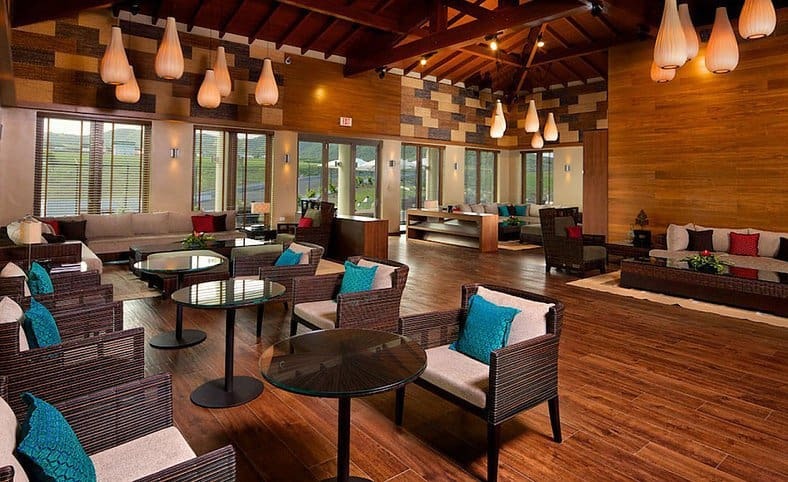 Ending your visit to St Kitts’ at the Yu Lounge is the perfect way to round off your trip. It’s all the same but in reverse and you actually get a little longer to enjoy the lounge due to check-in timings. There are shower facilities so you can make the most of your last hours on the island and make a stylish departure from the island feeling refreshed and calm. 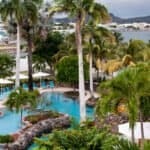 Of course, there’s a lot more luxury to find on the island – there’s the St Kitt’s Marriot Resort, a soon to open Park Hyatt and a fabulous Four Seasons Resort in Nevis but these are my personal favourite St Kitts luxury hot spots. What’s top of your Caribbean luxe list? I was in St Kitts as a guest of St Kitt’s Tourism Authority and British Airways. Many thanks to all sponsors of flights, accommodation, activities and meals. As always, my views and opinions remain 100% my own. Wow! I am going to recommend this place to my husband for our 20th anniversary next year! 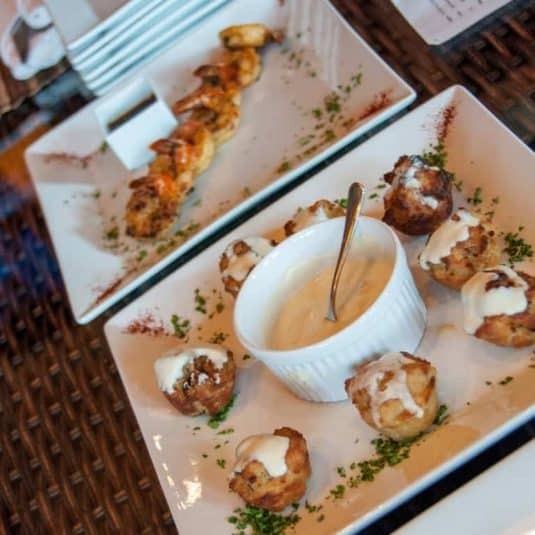 The food looks great too! Wow what a stunning looking place! I especially love the look of the bath tub and those views of course! Imagine just floating in your own private infinity pool taking in those views. With a mojito of course! What memories this brings back! Each place you have listed was superb as was the food we sampled. I do hope we both get to go back one day. We had an amazing week in St Kitts – as well as the food and gorgeous restaurants and hotels we saw I loved the adventure side. 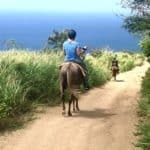 Horseriding, zip-lining and snorkelling – all fabulous. I’d love to do it all over again too! What a beautiful island with so many great things to do! After just returning from a 16 day road trip of Ireland, there is nothing that looks better right now than a relaxing and luxurious getaway. St. Kitts is one of the islands that has escaped in that area – looks like I’m going to have to change that soon! 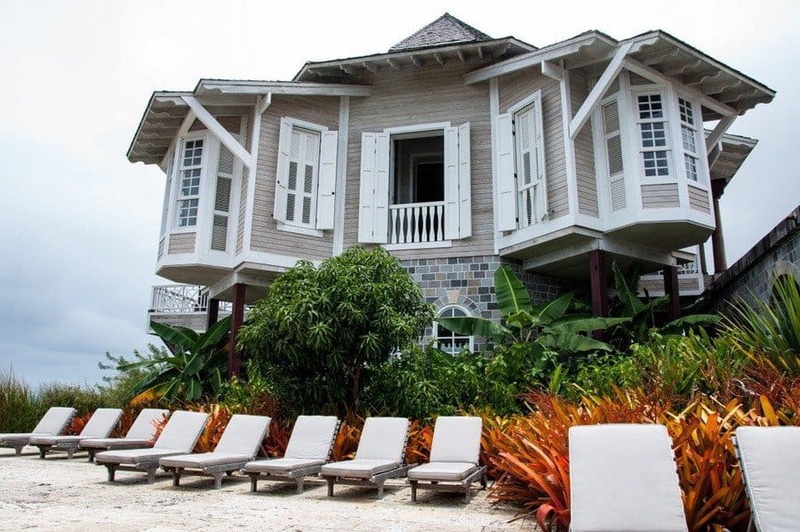 It’s a real gem on an island and quite different from others in the Caribbean in that it’s not so commercialised. Your road trip sounds amazing! Oh Suzanne – that spa in the rainforest looks like the most lush, relaxing, natural place for a massage or facial I’ve ever seen! You’d want to stay forever wouldn’t you! It is Shikha! And I treated myself to a massage while we were there. The rear wall is completely open so you have a full view of the rainforest and the wind in the trees and bird calls make the perfect soundtrack for a massage. Great blog, I really want to go there now. I particularly like the look of the house rentals. and I want to go back immediately – it’s a fabulous island!